⌚THOMAS SABO EARRINGS: buy cheap, postage free, fast & secure! THOMAS SABO Creoles are either highly polished and plain or decorated with glittering stones. The THOMAS SABO Karma Beads can be hooked into special creoles and Brisur earrings and give your ear jewellery an individual and special touch. So you can adapt your earrings to any outfit in color. Depending on the selection of the jewelry ball, your ladies earrings look playful, glamorous or rocky. A popular classic are the THOMAS SABO pearl earrings, which with their delicate shimmer are the epitome of femininity. Timeless designs and a unique design language are the special signature of THOMAS SABO. Extraordinary structures, fascinating details and special cuts characterise the extravagant earrings from THOMAS SABO. Black earrings with dark stones can be sensual and luxurious as well as rocky and striking. These are perfectly combined with the matching bracelets, watches, necklaces and rings from THOMAS SABO. A further eye-catcher are the ear clamps attached to the upper part of the ear. The combination of a silver chain with an ear stud creates a particularly attractive look. They not only complement the expressive looks of the Rebel at heart line, but also give elegant dresses a special refinement. The must-haves of the season, Ear Jackets and Double Studs play with urban styles and a feminine touch and can be combined with a wide variety of outfits. Ear Jackets and Double Studs from THOMAS SABO give every look a special touch. You can be sure of the admiring looks of your surroundings. 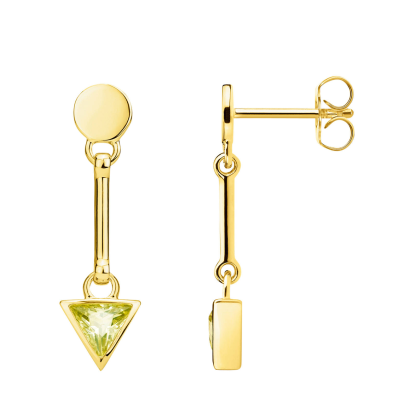 Since Ear Jackets and Double Studs take up existing THOMAS SABO designs, they can be ideally combined with other pieces of jewellery. Pearls perfectly complement the Pearls series, silver beads are an ideal match for the classic Dots line and small skulls complement bracelets, rings, necklaces, watches and pendants from the Rebel at heart collection. Whether for a birthday, anniversary or as a small gift - Ear Jackets and Double Studs are among the very special gift ideas for women.